As I was sitting here working, my cat Peekie B suddenly jumped on my desk (she never does that), and sat on my notebook and literally kicked my pen into my lap! Her message to write was very clear and right on time. She is completely aligned to Spirit in all that she is and who am I to doubt or question her wisdom! The temperature of the energy is slowly setting to high! This is definitely the last week of the FIRE and right now here in Colorado we are experiencing 3 days of snow! Just in time for a much needed cool down from the fiery energy that is building all around us. Watching the beautiful snow, I notice the rhythm and pulse of the snow as it goes from soft and dreamy, to fast and fury, to harsh and steady. It has a vibrancy and purpose to it that ALLOWS it to go with the flow trusting that where it lands is where it’s meant to land. Individual and unique snowflakes fall in unison landing together to become one. When the snow’s time is over it melts down to the earth to nourish, replenish, and cleanse. It allows it’s purpose to BE by going with the flow being in the moment. It’s truly a beautiful thing to watch. 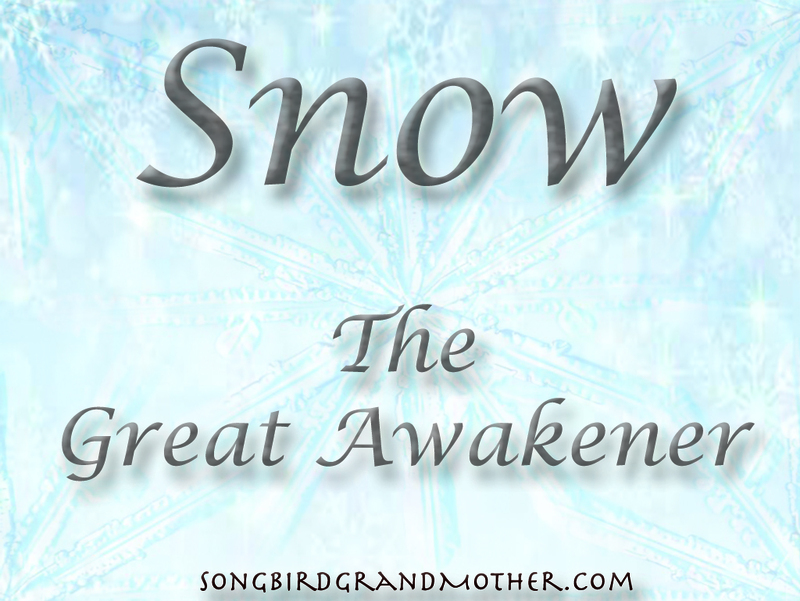 Snow is a great teacher on the path of awakening. It is a great time to go WITHIN and connect to the cosmos and AWAKEN your dreams. Snow is beautiful, rhythmic, and cleanses our energy. It awakens the childhood dreams, the beauty of love in the cold, the fun of play, and the joy and peace of silence. Snow slows us down and reminds us to enjoy the human experience. On a collective level we are all experiencing some kind of cleansing in our lives. We are being asked by Spirit to go within and meditate on the future. To allow whatever needs to be LET GO of GO in a gracious and loving manner. To clean out and cleanse the old.It could be the physical things like closets or possessions that no longer suit you. It could be the negative people, situations, thoughts, emotions that no longer work for you, or the relationships that are no longer for your highest good. During times of stress, fear, worry, or doubt it is important that you BE like the snow and fall gracefully allowing THY WILL of Spirit to blow you in the direction most needed right here, right now for your own Soul’s purpose and life’s teaching. As we go forward into the week, let us remember kindness, compassion, love, and to stop, breathe, and meditate with purpose and intention! The energy right now is cleansing. Allow the cleansing. You are facing much karma from times unknown to you. Many of the things happening right now are beyond logical or rational understanding. We are walking in a different world and are really starting to see things starting to shift and transition. The world is on FIRE and is rising in energy. The energy at this time becomes very explosive and for those living in dark fear it can become lethal and tragic. This is why more than ever, we as a collective must RISE ABOVE! Rise like the eagle! BE Positive, and allow whatever is to happen to happen. Be the snow, falling gracefully, lovingly, and collectively. Stick together and build your own snow mountain and remember that you are never alone. If you see someone in need of your smile, love, or help in whatever way, shape, and form you intuitively are guided to provide do it! Remember to hold your light, detach from the “outside” and go WITHIN for all the guidance! More than ever this week, people need more love, grace, and solace. Sending you all big volts of love and light! Until we Meet Again My Friends! Previous Post This Summer is on Fire!